WISE kind of resembles one of those Star Trek episodes where the Enterprise is surrounded by an invisible field / strand-like thing / group of aliens, and then later on in the episode they develop the technology to see them and BAM! There they are. 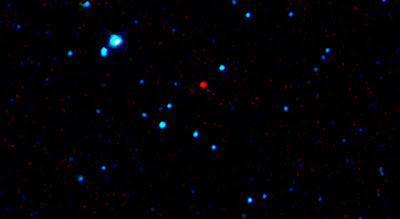 Since WISE can probe the sky in infrared (and very detailed infrared - NASA launched an infrared observatory before but it had a resolution of just a few dozen pixels if I remember correctly) it will be able to pick out hundreds of thousands of objects that we haven't been able to see before. And once we know their location it's a fairly simple matter to confirm it with Earth-bound observatories. If we are lucky the big catch will be a brown dwarf within a single light year or so. If WISE discovers something like that then 2010 will be the biggest year of astronomy in recent memory.